Posted 10:25 pm by Administrator & filed under News. The Hairpin Lofts and the Arts Center, Logan Square–Avondale celebrated its grand opening on November 15, 2011 with a community event sponsored by Brinshore Development and the Logan Square Chamber of the Arts. 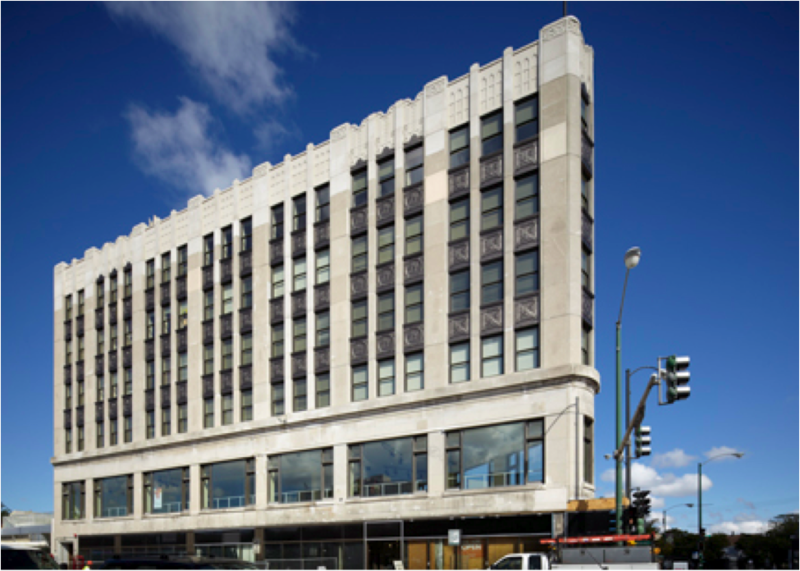 The event is the culmination of the multi-year restoration process to transform the historic Sachs Building, a circa 1929 Art Deco-style flatiron building, into a mixed-use development with 28 artist housing units, a community arts center and gallery space, and ground-level retail space. Extensive exterior preservation was required, including recreating the parapet from historic photos and restoring the iconic camel-motif exterior panels and lobby floor tiles that referenced the building’s original use as the Hump Hair Pin Manufacturing Company’s store and office. The building was designed to meet LEED Gold certification, as well as comply with the rigorous requirements of the Enterprise Green Communities and the Center for Neighborhood Technology Energy Efficiency grants it received.